Using ‘state of the art’ technology, geothermal fluids are passed through a heat exchanger where energy (heat) is transferred to a working fluid (pentane). The pentane then boils to form a high-pressure vapour which then drives the turbines, turning the generator. After the vapour has passed through the turbines, it is condensed back to a liquid and returned to the heat exchanger in a continuous cycle. The pentane is not consumed as a fuel, but is simply used as a working medium to extract energy from the geothermal water and steam. Having given up much of their energy, the geothermal fluids are returned to the deep geothermal reservoir, via re-injection wells. This practice not only prevents geothermal fluid discharge into the environment (where adverse effects would occur) but also maintains reservoir fluid mass. This in turn enhances the long term sustainability of the geothermal resource as well as minimising the possibility of any surface subsidence. The Ngawha geothermal field is the only high temperature geothermal resource in New Zealand, outside the Taupo Volcanic Zone. It has few natural surface features, apart from the springs adjacent to Ngawha Springs Village which, although modest in flow, are highly valued for their cultural and therapeutic properties. There are several lakes with geothermal inputs and also some soda springs. The geothermal field is understood to be between 20 and 40 square kilometres in area and is characterised by porous layers of rock beginning at about 600 metres below the surface which are saturated with water and heated from below. The reservoir is sealed above by layers of solid caprock, which is a harder or more resistant rock type overlying a weaker or less resistant rock type. The caprock allows considerable pressure and temperature to develop as the water is heated up to 230○C in the centre of the field. While above boiling point, steam is not present because of the high pressure. Steam is only produced when water is brought to the surface via a wellbore which allows the pressure of the rising fluid to reduce. 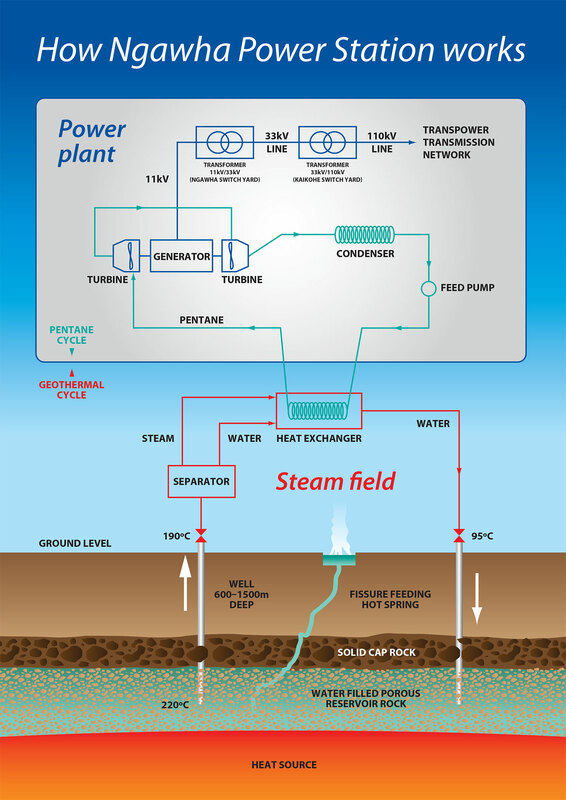 The pressure within the reservoir drives the water up the well and a mixture of steam and hot water is produced – both of which contain considerable energy which is available for conversion into electricity. The geothermal fluid is returned to the field at approximately 95○C through a series of reinjection wells thus maintaining fluid levels in the field.